Formed in 1991, Datasat Digital Entertainment set out to provide a superior listening experience to movie-goers. A milestone was reached when, in 1993, Steven Spielberg released Jurassic Park – the first movie to feature Datasat sound technology. n 2016 Datasat was purchased by ATI. 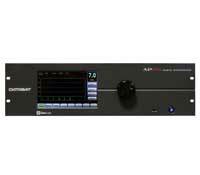 They have since developed the AP25, which is based on the ground breaking AP20 audio processor and now has additional features including an improved power supply, HDMI 2.0 and HDCP2.2 and 20 additional memory presets. Both models of AP25 have an additional option of Dirac Live, state-of-the-art digital room correction technology that improves the listener experience by correcting for room modes and anomalies using high-resolution filter technology.